I've had a good idea. I think I've blogged about the Ilac Centre before. They have a library in there that's always full of people because there's a free language lab and there's a magazine section and you can just sit and read or do whatever you feel like. It's a cool idea, having a library in a downtown shopping mall. Plus, there's a room in there where they arrange language exchange meetings. So I'm thinking, maybe I'll go there once in a while and study Italian. After all, my house mate is Italian. I won't tell him what I'm doing; that way if I start to understand I'll know what he's saying if he talks about me on the phone. Ha, ha! I know there's an amazing library at college, but you know what? I'm there all day long and the last thing I want to do in the evenings is go back to Trinity. This will be a whole different place and I'm hoping I'll meet different types of people at the weekendly language exchange. In other news, I've decided to learn how to make great soup. I'm tired of not knowing how to cook and I think soup is a good place to start. I have even bought a recipe book. I can show it to you on Amazon but I picked up a second hand copy at the Liberty Mall. I've only been there for a few minutes just before closing time but I'm gonna check it out this weekend as it looks like the sort of place that's in my budget! 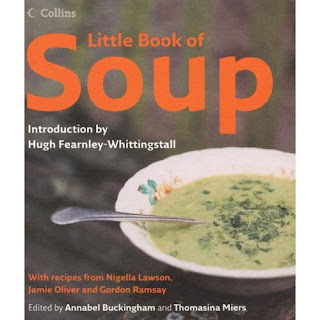 Anyway, back to soup: I went down to the greengrocer with my new(ish) book and showed it to him, because I'm not so great at knowing what's what in the cooking department. I LOVE that guy and this is why: When I told him that I was going to get into soup cooking, he said that every day he'll put aside "imperfect" vegetables for me -- like funny shaped carrots and stuff: "They taste just as good, love," he said, "but there's a lot of people who won't buy them. I'll let you have them for almost nothing because I hate to see things go to waste." So that's that: I'll be living on soup from now on! Let's hope I can get to grips with this whole cooking business. I told my friendly greengrocer I was really grateful, and he said, "Sure I've a daughter meself and I'd like to think of someone looking out for her over there." Apparently, she's a milliner in Manhattan! Pretty cool, huh? She does all that fancy stuff, and she's planning to come back to Ireland when she's ready to set up her own business. So that's me today. Three cheers for the weekend! Of course I know other people from college but I didn't seem to click with them as well. Then I go home and Bepe, who I have to say is a good flat mate, is either working evenings cause he's a chef or out with HIS girlfriend. And then the only realy new friend I've gotten to know in the last little while is a single Dad and his time is pretty tight too. Sigh. It's not like I've loads of free time because, despite appearances, I am actually working really really hard right now. Plus, I am only going out to things that are either free or cheap because I've got to save for Xmas. I rang Dublin Tourism to see if they were going to keep running the blog on their site and the lady said yes, for the time being, and that there'd be some free tickets to something soon and she'd try to organise some "recompense" for the Xmas season so I've got that to look forward to. I think maybe I should go out on my own a bit more. But where? Bars are really out because it's just lame and pathetic to sit and drink on your own, the cinema is OK but it doesn't really do anything for the "I'm spending too much time on my own" issue. Anyway, I'll be back soon. Hopefully in a better mood. In Ireland, they don't really have proper winters. Not like we do back home in Newfoundland. But today the weather is doing a convincing impression. Personally, I don't care. I got my flannel peejays and I've a raincoat so I'm good to go. Plus, there's the wonderful consolation of knowing that with lower temperatures, wind and rain comes the just compensation of my latest favourite tipple, another Dublin staple (and something you can really only have ONE of: HOT PORT AND BRANDY!! Wow! What a delight. It's the same as hot whiskey -- whiskey topped up with boiling water, with a lemon slice, cloves and sugar, except, obviously, with port and brandy. Amazing. Well, but you can imagine why one is enough, for the liver as well as the wallet. Studying is actually going really very well this week so I am feeling extremely virtuous. Also, because it's suddenly gotten chilly, I've been spending more time in college in general. I know more people now so there's always someone to talk to between bouts at the library and Trinity's Buttery canteen is great when you're watching expenses. When Mom and Dad first told me that they were coming to visit for Christmas, I was disappointed I wouldn't be getting home to see my peeps, but now I'm really OK about it. Plus, it no longer seems all that far away. They will be here in...what? About six weeks. Although we're descended from Irish fishermen, they've never been here before and I want it all to be perfect. So while I'm not usually one for forward planning, I would welcome some suggestions! Well, Friday's party was a success. Quite subdued, as parties go. I didn't even have a hangover on Saturday morning. Which was just as well, as I had arranged to meet my friend, formerly known as the Beautiful PhD student, who was taking care of her daughter for the day. We went to the Wax Museum together with one of her little friends from Kindergarten, and all thanks to the free tickets I'd been given by Dublin Tourism. Apart from my sister's three kids, I have never spent much time around children and I felt kind of awkward because my friend's kid kept starting at me. I asked her if she liked Spongebob. She said "No." For a cute little girl, she sure was scary. We met outside Trinity and made our (short) way to the Wax Museum on College Green. We had to hang about a bit outside while the girls ate chocolate bars because we didn't think they'd be able to bring them in. My friend's daughter kept staring at me ominously. "Are you my daddy's girlfriend?" she asked. "Ah no," I said. "We are just friends. We haven't known each other that long." "Because he had a girlfriend before and I hated her." "Oh...well, I'm not his girlfriend, so I guess that's OK."
"My mammy used to be his girlfriend." I was sweating here. I'm telling ya. 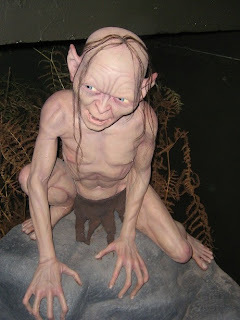 So then we went in and it was fine until we got to the wax statue of Gollum, whereupon the friend from Kindergarten suddenly started to cry really, really loudly. As we tried to comfort her (the only bright idea I had was to offer more chocolate), she said, "I thought he was gone to Heaven." Turns out, her granda died recently and she thought that Gollum was him. "Honey, your granda was one ugly dude." That's what I thought, but of course you can't be mean to a sobbing infant. 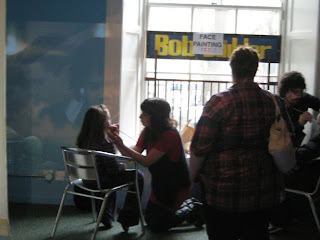 Fortunately, there was face painting on so we did that and the whole situation was turned around pretty fast. 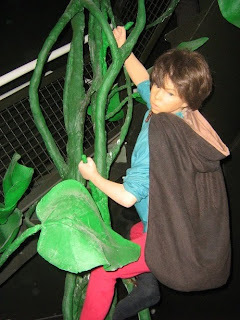 And Jack and the Beanstalk went down pretty well. I'm telling you, I really like this guy but I'm actually glad now that he is unavailable for a relationship as it's clearly a minefield, getting involved with single parents. After the Wax Museum, we shifted left about 100 metres and checked out the chocolate festival in Temple Bar, where, thankfully, nothing reminded either of the little sprites of deceased relatives. I was telling my friend the greengrocer the whole story later, and he told me about his grandmother's wake and how she fell out of the coffin. But that's another story. It's funny, but since Hallow'een, there's been a definite change in the way things feel. I mean, although there's no snow or ice, there's a feeling of winter. I need a coat. And while I would love to get something fantastic and expensive and vintage in one of the many shops that drive me crazy with envy, I will probably go to Penney's, as every penny counts (ha, ha) and I'd rather spend MY pennies on going out than looking fab. (Not that I won't, but you know what I mean. Dublin Tourism had asked me to review the Wax Museum in thanks for the free tickets so here's my two cents: A great day out for all the family! The fairytale stuff will go down well with kids, but rush past the scarier items if you're with impressionable little girls.